Does your website have detailed tracking and heat maps set up? Do you know how to find out your abandonment rates for each level throughout the checkout process? How deep are you able to analyze your analytics in order to find bottlenecks? Do you know where your users are looking at and clicking on? These are some of the common questions we ask our clients. If you do not have detailed tracking setup for your online store, you’re missing out on essential information. We can fix this for you. We build completely custom shopping cart systems integrated with on and off-site payment processing with detailed tracking each step of the way. Not only are we tracking their cart contents, we are tracking where they click, what they click, and a heat map of what your users actually see. Throughout each step of your website’s checkout process, potential buyers will abandon your website. That’s a fact. There’s nothing you can do if someone has no intentions of buying your service or product. However, you can increase the number of buyers if you make your entire checkout process streamlined. Generally, the two biggest drop-offs are after they click “checkout” and when they are asked to pay for their order. If you’re tracking this, you’ll normally see a large percentage of potential buyers that never make it past the first step. If you streamline the checkout process, you can easily get more people to go to the next step. When it comes time for them to pay, there are a few things we should talk about. First, you should never force them to leave your website (Authorize.net, PayPal, etc.) to process their payment. If you do this, you’re losing customers. It is better to present an on-site credit card option and other off-site options. We can create your own custom shopping cart that handles credit card processing on your website. Without taking your potential customers off your website through the entire process, unless they click the option to, you’ll notice a higher retention rate. This includes the most important step – purchasing. Using the best methods to guide users throughout your new streamlined checkout system, you’ll notice an increase in sales. If your business could increase its online sales by 10, 20 or even 30 percent by changing the reasons your potential customers are leaving your website, wouldn’t you change it? 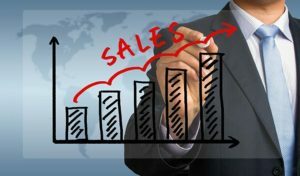 By integrating and analyzing analytics, we can track the essentials to increasing your sales. It could be something as simple as placing the “Order Now” button in a more visible location because they aren’t seeing it. If your website already has its own credit card processing system but something is causing your potential customers drop-off, we are available for a free consultation and can provide a remedy to increase your sales. If you’re ready to increase your online sales, click here to contact us. Ready to see how your website ranks with our custom SEO analysis tool? Get Your FREE SEO Analysis! Why Should I Start A PPC Campaign? Why Does My Business Need A Blog? Custom Web Applications — Worth It? Want A FREE SEO Analysis Of Your Website? 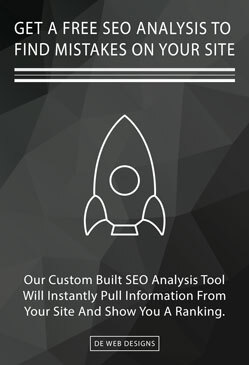 We built our own personal SEO analysis tool. You enter some basic information, click submit, and it automatically pulls your websites code — same as search engines — and runs the code through our analyzer. It then briefly checks the code for the required tags, common mistakes and so much more. Once it's done with that, it passes several sections through our own grading scale. We add up the grades and come up with a final result, which we get ready for you. This entire process takes roughly five seconds. You are able to see common SEO problems and how to fix them! What are you waiting for? 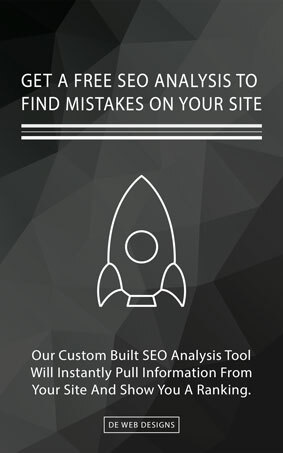 Get A FREE SEO Analysis — Instantly! Copyright © 2019 DE Web Designs. All Rights Reserved.